1 pc. 45,51 EUR ea. 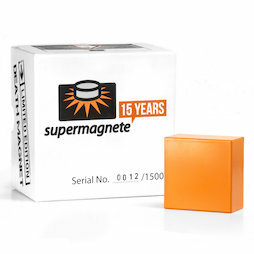 We at supermagnete celebrate our 15th company anniversary! For that reason, we pimped our infamous bestseller, the DEATH MAGNET, and introduce it as our first ever Limited Edition. There is a total of only 1 500 available and each of the specially designed packages features its own serial number. The stove-enamelled DEATH MAGNET in supermagnete orange is carefully bedded inside a cardboard box and awaits its next mission. It almost appears innocent on the white fabric - but don't be fooled. Its 100 kg holding power must not be taken lightly. Definitely review our enclosed safety tips! 1 pc. 149,08 EUR ea. The pretty packaging makes this Limited Edition a great gift for magnet lovers. Collectors and supermagnete fans will be thrilled with a special edition of the DEATH MAGNET. Even if the DEATH MAGNET looks innocent here: Keep credit cards and mechanical watches as well as children away from it. The DEATH MAGNET is definitely not a toy. Please note that regular use can lead to scratches in the coating. Our cooperation partner "Magnetic Games" shows the impressive limited edition DEATH MAGNET in action.